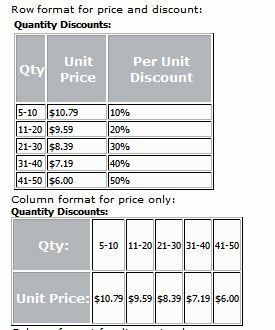 Uses standard vpasp quantitydiscounts data, and you simply add a new template-field to your product template files to display the quantity discounts in the format that you want. The files which format the html are split out from the main logic so that it's easy to change the formatting. eg: [BYZ_PRODUCT_QTY_TABLE_ROWS_PRICE catalogid] - there are 6 different template-fields to choose from (see the demo link for examples). It'll analyse your discount data and automatically calculate/show all the right percentages/prices for you when displaying. For example, if you're using a discount percentage (ie a value of below 1) instead of a discount price, then it'll work out what the corresponding price is and show that in the price value, and it'll also work in reverse too, calculating percentages if you're using priced discounts. So there's no need for you to change your existing discount data to get this new format working; the template-fields/functions do all the analysis for you and outputs it in the way that you want it. 02 27-AUG-2009 Upgraded BYZ038 (from V08 to V10). Altered html slightly to allow it to pass html validation with no warnings/errors. 03 06-OCT-2009 Enhanced to cater for groupfordiscount columns on the products and quantitydiscounts table. Note: Your xproductgroupdiscount config option must be set to Yes if using groupfordiscount. 04 14-JAN-2011 Made compatible with VPASP V7. Changed product query to make it use less memory on the SQL side. Changed to use + at the end of the range description when top range is over 10,000 (ie to show 51+ instead of 51-99999).